Note: While this review will be spoiler free, it will reference previous books. 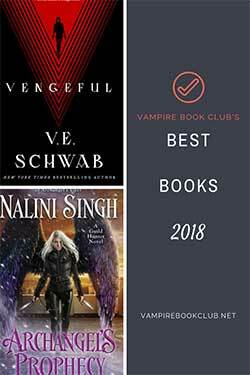 If you haven’t started this series yet, check out VBC’s review of book 1, Future Shock. It’s been a full year since Elena first got involved with the Aether Corporation and agreed to go into the future under the guise of bringing back useful technology. It’s been six months since Elena and the survivors from the first trip were sent again into the future to bring back another time traveling team and barely escaped with their lives…again. Now, Elena and her boyfriend Adam, along with the other travelers, just want to move on and lead normal lives. Which is easier said than done with Elena looking over her shoulder waiting for the Aether Corporation to make another appearance. It doesn’t help matters that Adam is acting increasingly guarded and strange. Ever since bringing back Genicote—his future cure for cancer—Adam has become increasingly withdrawn into his research trying, and failing, at making the cure viable. When Adam goes missing one day, Elena knows who to point the finger at: Aether. 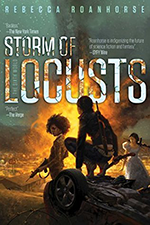 Elena will once again be sent into the future, this time to save Adam, but once she gets there she discovers a world ravaged by a deadly virus. A virus most likely originating from Genicote. They’ll have just one last chance to save the future, and they better make it count because there’s someone in the present who doesn’t want them to live to see the future. Here we are at the end of the trilogy, and I feel like we’ve been here before. I don’t really know if that’s fair considering this is a book about time travel. Maybe it’s better to say that I feel as though the reasons the characters keep going back again and again were getting a bit taxing. I kinda wanted to scream at them: STOP GOING TO THE FUTURE!!! Because every time they do something bad happens, and it becomes a rinse-repeat scenario of them either trying to fix it in the present, or go back to a different future and fix the problems there. Part of me wonders if this was a conscious decision on Elizabeth Briggs’s part. There’s definitely a feeling of finality in everything that transpires in Future Lost. I do give Elizabeth Briggs major props for keeping each travel sequence unique, showcasing all the varied ways the future can come to fruition. They all seemed plausible and most had both their good and bad parts (except maybe this last iteration). I like how the future sequences are always quick and pulse-pounding whereas the present is more evenly paced, and oftentimes drawn out, that is, until we get to the ending where all bets are off. Elena is still at the center of our story of course, and she leads us out the same way. I like how much she’s grown from impulsivity to actually taking the time to consider her actions, and when they’re not necessarily the best, taking full responsibility. 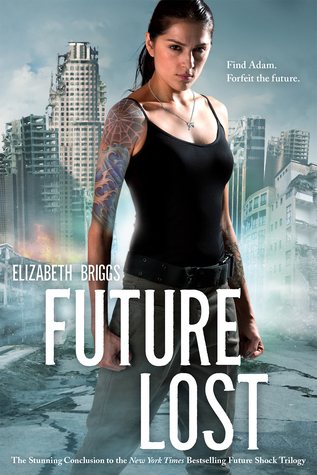 Elizabeth Briggs brings a satisfying end to the trilogy with Future Lost. I liked the clever way she ties everything back to the first book where all the action started. Despite the feelings of repetition, overall, this is an entertaining trilogy that does a great job with all the twists and turns that are encased within time travel.